i thought i would do something a little different this week. 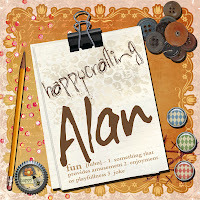 The project was inspired by visiting a new crafting friends blog The Male Crafter. He was making a Meander Book and i was interested in all about what this book was. This project also allowed me to dip into the scrap paper bin we all have. It also means that we can re-visit all our stamping goodies to stamp up pages. 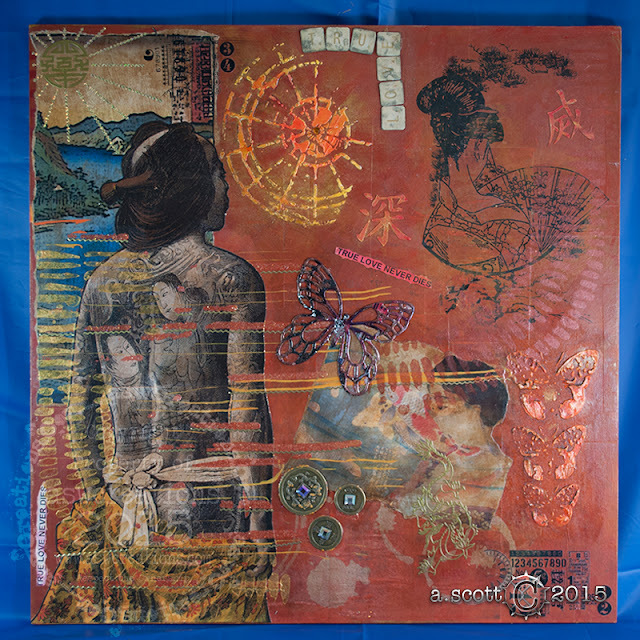 The main imagery i have used are TIM HOLTZ CLING MOUNTED STAMP SETS in fact this project i also dipped into my stamp collection and used a LOT of older Tim Holtz Stamp sets. Right back to several years ago when i first started to rebuild upo my stamp collection so it just goes to show that stamps have a wonderful shelf life if you look after them. I took the key/lock and screw head from a KANBAN Stamp Set called KEYS. These stamps along with a whole box full of goodies are available from THATS CRAFTY ON LINE. I highly recommend that you book mark and keep calling back to see the wonderful deals that Laura does. Make as many strips as your booklet will need. Remember when folded 2 sections will give you one page. As you can see here i have 4 sections. the centre sections will be secured together to form a single page. The outer sections will be used to make the pages that have the top section open so that you can insert a tag. Mark a 'cut-out' with pencil so that you know what page is what. Its easy to get mixed up so make where you can to give a visual aid. This is how the end sections will look when you have joined them with the other cut out section. I have constructed 2 of 4 strips. All i have to do is combine them together to give me one long strip. Turn onto to back so that the opened pages are on their sides. This will then help with gluing the opened pages together. These will be flat and not opened. This is how your finished phase 1 will look. To make your cover place the insides onto a piece of card stock and then allow an edge and mark round. Make 2 covers 1 Front 1 for the back. To make the Gusset. Take some card stock mark out the length and then double the centre of your width of the constructed insert to give you the width of the side. Then allow at least 1 inch for each side flap. Here you can see how the centre of the constructed pages has been doubled to give the centre section of the Gusset. From your paper stash select papers to cover the card stock. Do this with a good strong wet glue as it will give you time to move and make sure one edge is level. Front and Back as well as the reverse side covered with paper and then trimmed to size. Now then lets take stock of what we have A centre set of pages with opening for tags, Front and Back sections and a Gusset. Using double sided tap on the front of the inside pages section this is then secured onto the inside of one of the cardboard front page. Allowed margin all around the three sides. Top/FRONT Side and bottom. Make a template from card stock and then dive once again into the paper stash bin so that you can cover each page. Take the tags and then trim down to size. You want them to be about half an inch taller than the page that has the opened top. Again use a corner punch and then with a piece of ribbon secure into place with the wet glue. A house hold peg will secure the ribbon into place until its ready to be used. Time to play. 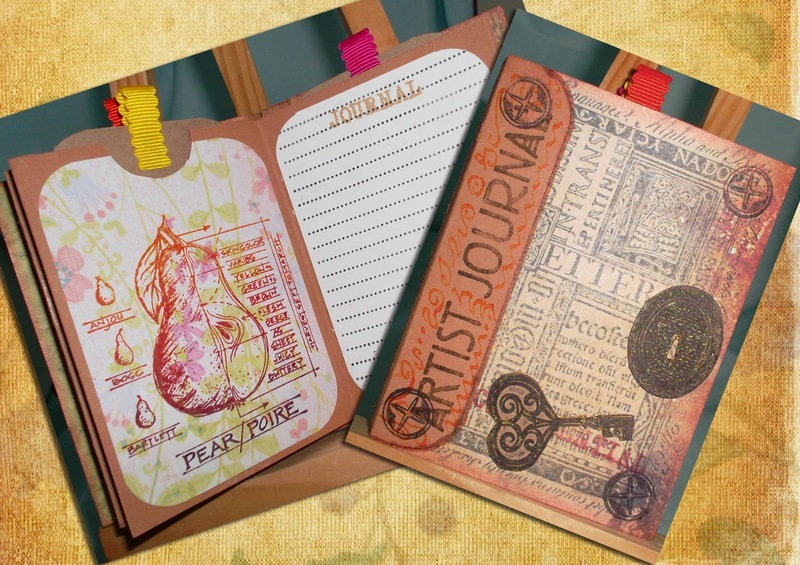 Use the papers that you have and the stamps and just embellish the booklet how you want to. There is no right or wrong way to do this its just your freedom of choice when it comes to your stamps. I hope that this booklet will give you the opportunity to make small memory booklets so that you can give to family and friends. Any questions please contact me and i will get back to you as soon as possible. I just came across some old folders and ALMOST threw them away but grabbed them back and put them in my 'have to use' pile. You gave me the inspiration to cut and fold them up! Thanks for your great instructions. Thank you for your kind comments and welcome to my blog. I hope that you will become a visitor and l hope to continue to inspire you in your crafting. If there are any questions about what you have seen or read on my blog please contact me with your questions and l will do my best to get back to you a.s.a.p.